Return to the traditional slots with a modern twist in this game of 5 reel fun. Click here to play! Fruit, Lucky Sevens and Bells await you in this updated homage to classic slots machines. Many of the original symbols are found in this throwback game. As you might expect lucky sevens are a hot commodity. This symbol is a wild and will replace most other symbols to help you create more wins. Of course, you'll also find fruit. 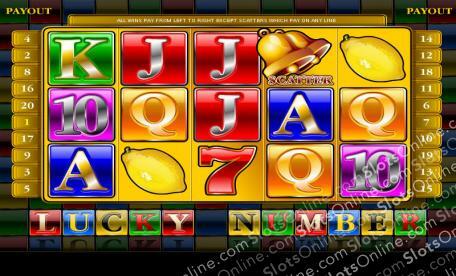 Spin two to five lemons across a pay line to get up to 5000 times your bet. Plums and cherries will payout as well. Two to five of either of these will get you 1000 and 750 times your bet respectively. A, K, Q, J and 10 will also help you out in your quest for the cash. This is where modern twists payoff the most. Lucky Number has scatters and bonuses that will see you really cashing in. Spin three to five golden bells to trigger free games, and golden lucky sevens on a pay line will trigger a bonus game. Try out this modern version of traditional slots. It captures the history of the game and allows you even more chances to win! The golden bells act as scatter symbols. Spin three or more of these and you'll win up to 20 free spins! The flaming lucky sevens act as a wild symbol. They will replace all other symbols, excluding scatters and bonuses, to create more winning lines. If you can spin three or more golden lucky sevens anywhere on a pay line, you will trigger the MixBricks bonus feature. During this feature you will be presented with three rows of bricks that will be red, yellow and green. They all have a number assigned to them. You'll have to mix them up and pick from them to try to get the highest numbers. You will get three picks, the total of which will be your bonus.